Cooking is a delicate art. A teaspoon too much salt could disrupt the dish, and a 1/4 cup of water could be the difference between a creamy or runny sauce. When you’re trying a new dish for the first time, chances are you’re copying the recipe to the letter. But, have you ever been gathering the necessary ingredients for a recipe and stopped to think, “Why do I need that?” We’re talking about ingredients that just don’t seem to make sense. Ingredients that you wouldn’t think you’d need to complete the dish, but the recipe calls for it anyway. We call these unexpected recipe ingredients wild cards, and sometimes they make or break your culinary success. To honor these ingredients, let’s take a moment to discuss some of the most wow-worthy wild card unexpected ingredients. 1. Raw Chicken Livers in… Fettuccine Bolognese? A bolognese is a meat based sauced originating in – you guessed it – Bologna, Italy. This savory, thick red sauce pairs well with most pastas and can be quite easy to whip up for a traditional Italian Sunday gravy. Typically this recipe calls for ground meat, including beef, veal, or pork, or sausages. In fact, my mom even used to throw in any leftover Genoa salami to spruce her’s up. Well, if you ask former Top Chef finalist and creative culinarian Ed Cotton, he’ll tell you a different secret ingredient: raw chicken livers. Cotton blends raw chicken livers into the uncooked meat mix for depth and flavor. When we first saw this unexpected bolognese recipe, we were a little startled. But, then it made perfect sense: the savoriness of the chicken livers caramelized with traditional bolognese meats sounds pretty scrumptious to us. 2. Sugar in… Mac and Cheese? If you couldn’t tell already by our Mac and Cheese Appreciation Day blog, we’re pretty big mac and cheese fans at Basket. We were ecstatic to learn that during Basket’s stay on the Steve Harvey show (read all about that here!) that celebrity chef Lawrence Page was going to whip up his signature mac and cheese, using all ingredients he found at the best price on the Basket app! We couldn’t wait to hear what Chef LP was going to add to his mac and cheese. Butter, cheddar cheese, mozzarella, provolone, salt, pepper… sugar? We were confused when Chef tossed in 3 whole tablespoons of white sugar. His reasoning? “Mama used sugar in everything growing up.” Well, if his mama did it, it’s good enough for us! Check out the full recipe over on Steve TV. Yes, you read that right. Kool-Aid pickles are totally a thing and we could not be more enticed. Grab yourself a 32 ounce jar of dill pickles, 3/4 cup of sugar, and 1 packet of unsweetened Kool-Aid to try it yourself. We followed this “Koolickle” recipe, and while the flavor was certainly new, we were not sorry we tried it! 4. Sauerkraut in… Chocolate Cake? Upon further research, we learned that sauerkraut is not an unexpected ingredient to add to cake in Eastern Europe. For us over in the states, we were a bit surprised. Turns out some people call this cake the “Don’t Ask Cake,” because no one is able to guess the secret ingredient – and are shocked when they find out! In fact, sauerkraut loses its sour, salty taste when baked with the usual chocolate ingredients. Instead, it adds a moist texture that can even be mistaken for shredded coconut. If you try this chocolate sauerkraut cake recipe, please Tweet us over @BasketSavings – we’re intrigued! 5. Instant Mashed Potatoes in… Fried Fish? Instant mashed potatoes are a pantry staple that we refer to as “Old Faithful.” There when we need a quick side dish, and reliable for a stick-to-your-ribs meal. However, we had never thought of coating our fish filets with it. And to be honest, we’re kind of bummed we didn’t think of this first. 1 cup of instant mashed potatoes, garlic powder, dried thyme, oregano, and salt and pepper combine for a tasty, crunchy coating. Head on over to the Basket app to discover what fish is on sale at your super market this week, and toss in this unique coating for a cheap, delicious dish. 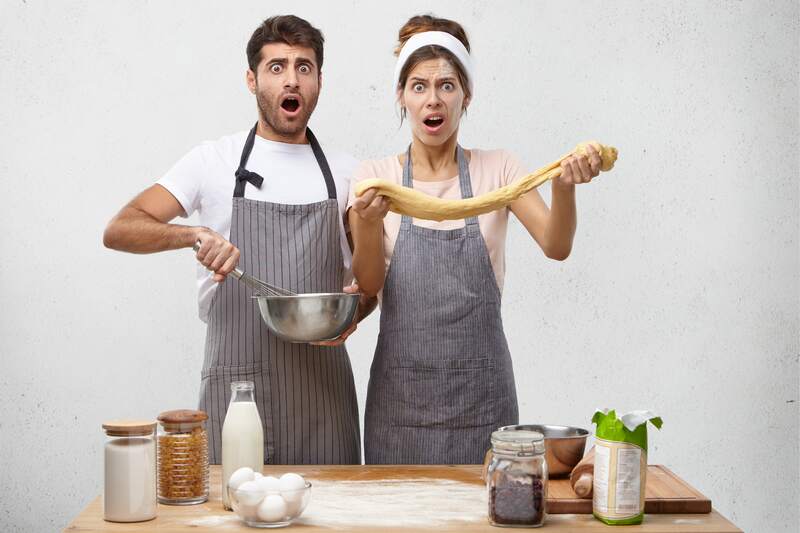 Sometimes the ingredients in a recipe make us do a double-take. While they might be unexpected, we value the unique, well-rounded flavors they bring to our cooking. Be sure to download Basket before trying any of today’s recipes: because even if the ingredients are unexpected, their prices won’t be.